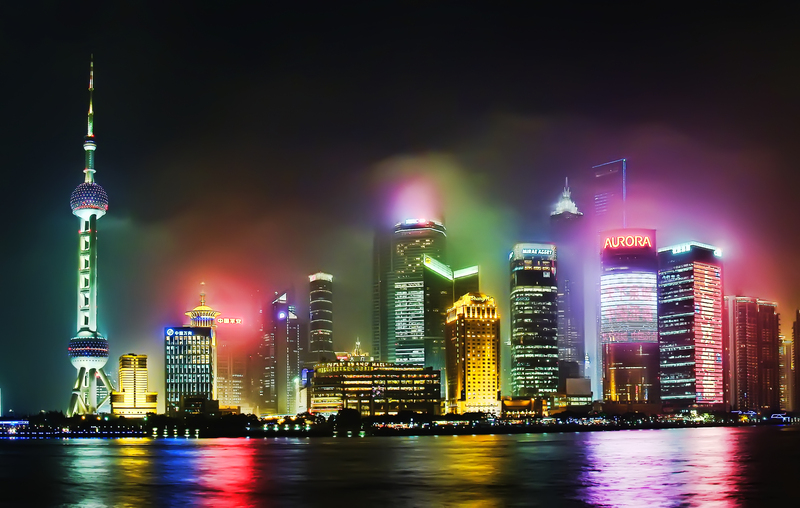 Flights to China from Europe for £268! 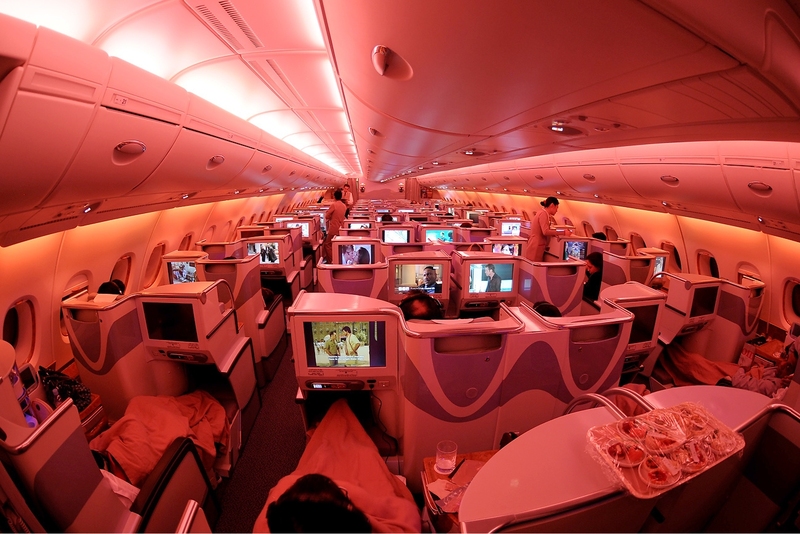 Have you ever travelled with the world’s largest passenger airliner? If not, here is your chance. Now you can book a trip to China for £268 and you can try the Airbus A380 two times in a row! Departing from Geneva to Beijing or Shanghai and back to Dusseldorf. There is a stopover in Dubai on both ways. All flights are operated by the Emirates which is one of the best airline in the World. Dubai-Beijing and Beijing-Dubai sectors are with the Airbus A380. Thanks to the Google Map, now you can virtually walk on the board of A380 if you click here. Travel period: from October 2014 to February 2015. For booking the ticket please visit Ebookers.com. From Shanghai Airport to the City center you can travel with the Maglev Train which is the World’s fastest train in regular commercial service with its 431km/h operational speed. To get to Geneva on a budget I advise you to search a low cost EasyJet flight near from your location. If you do not want to miss our next deal, please follow us on Twitter or like our Facebook page. Prague to Shanghai and Beijing for only €244 – round trip! Travel from October 2014 to February 2015. It is probably an error fare so don’t hesitate too long! Don’t call the airline or Online Travel Agency! 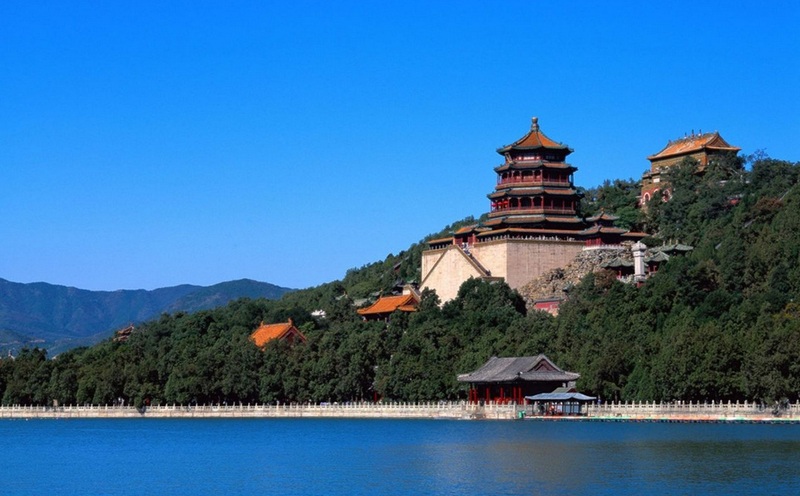 Flights to Beijing from Europe for only €261 – round trip! WOW! Emirates Airlines currently runs a promotion to Asia. 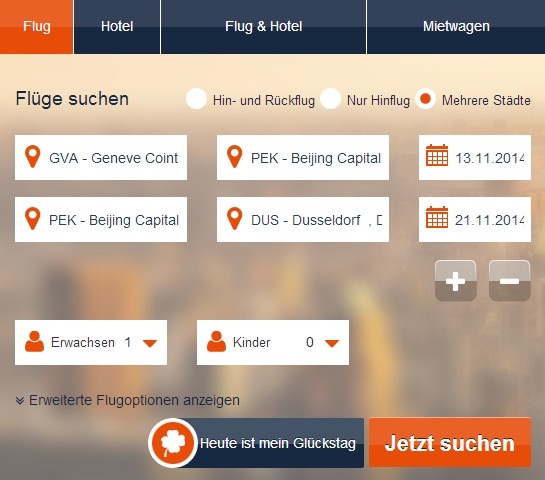 Tickets from Switzerland to Beijing and back to Germany are available from €261! It works to Shanghai as well. All flights are operated by Emirates which is one of the best Airlines in the World (SKYTRAX 4 Star Airline) and have a stopover in Dubai. What’s more you can fly on the Airbus A380 SuperJumbo! Bookable on Airfasttickets.de. Please use ‘Multi Cities’ option as shown below. 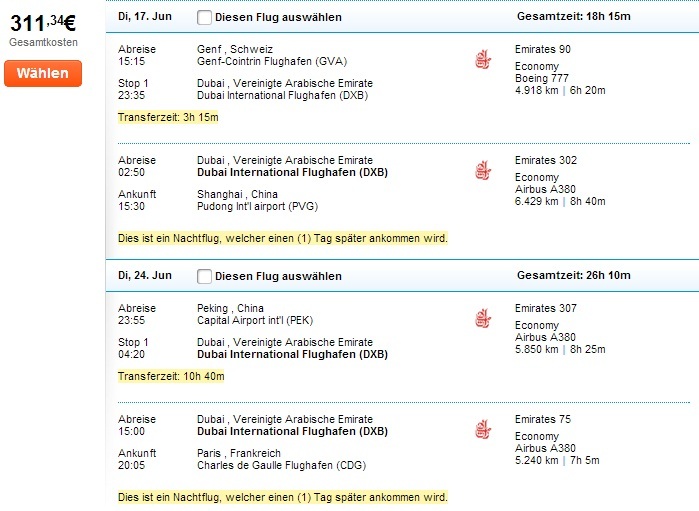 China from Europe via Dubai for €311 – with Emirates A380! Have you ever travelled with the world’s largest passenger airliner? If not, here is your chance. 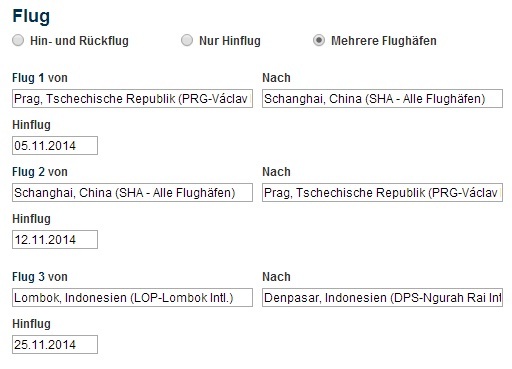 Now you can book a trip to China for €311 and you can try the Airbus A380 three times in a row! Departing from Geneva to Shanghai and back from Beijing to Paris. There is a stopover in Dubai on both ways. All flights are operated by the Emirates which is one of the best airline in the World. Dubai-Shanghai, Beijing-Dubai and Dubai-Paris sectors are with the Airbus A380. Thanks to the Google Map, now you can virtually walk on the board of A380 if you click here. For booking the ticket please visit Ebookers.de.